Traumatic injury to the aorta (TAI) accounts for approximately 15% of all deaths due to motor vehicle accidents. While 90% of patients with TAI die before reaching a medical facility, those that survive to reach the hospital have a 30-40% mortality within the first 24 hr . It is in these patients that a rapid and accurate diagnosis of TAI is critical to survival. The mechanism responsible for TAI in cases of blunt trauma is felt to be a shear injury to the aorta from rapid deceleration. The injury is usually the result of a high-speed motor vehicle accident but can also develop from a vertical fall or a plane crash. Those portions of the aorta that are relatively fixed in position are most prone to injury from shearing effects: in survivors of TAI these include the aortic isthmus (90%); aortic root (5-10%); or, less often, the descending aorta at the diaphragmatic hiatus or at the site of a hyperextension injury in the thoracic spine. The resultant aortic injury can range from a focal intimal tear or intramural hematoma to complete laceration or transection of the aortic wall. Injuries to the ascending aorta are almost invariably fatal, as they result in pericardial tamponade and aortic valve disruption. While injuries to the aortic isthmus can likewise be fatal, containment of a mural aortic injury by the adventitia (pseudoaneurysms) or periadventitial tissues (false aneurysms) can prevent exsanguination and allow a patient to survive long enough to be evaluated. The initial imaging evaluation of suspected aortic injury remains the portable chest radiograph, usually obtained with the trauma patient in the supine position. Radiographic abnormalities suggesting an aortic injury include widening of the mediastinum, obscuration of the aortic knob, thickening of the right paratracheal stripe, a left apical cap, and rightward deviation of the trachea or in-dwelling nasogastric tube, all findings of a mediastinal hematoma. A normal portable chest radiograph, particularly an erect film, has a high negative predictive value for excluding aortic injury (approximately 98%) . It is well recognized that only a small minority of patients that undergo evaluation for TAI will be found to have such an injury, in large part because the clinical evaluation of the trauma patient is difficult and the chest radiograph is a sensitive but nonspecific indicator of TAI. The initial role of CT in the evaluation of TAI was limited due to relatively slow scan speeds and limited resolution in the uncooperative trauma patient. Both the increased availability of spiral CT scanners in trauma centers, with their inherent rapid acquisition time and high contrast and spatial resolution, along with increased utilization of spiral CT for the evaluation of head, spine, abdominopelvic, and musculo-skeletal injuries have led to renewed interest in the use of spiral CT in this setting. The early efforts to determine the role of CT in the evaluation of TAI focused on patients with a low to moderate suspicion for TAI and equivocal chest radiographs who were selected for angiography based on the detection of mediastinal hematoma. This was mostly done in an attempt to reduce the percentage of negative catheter aortograms performed [28,29]. More recently, several large series comparing spiral CT to conventional angiography for the diagnosis of TAI have shown that spiral CT is an accurate and cost-effective technique that provides direct evaluation of the aorta while obviating the need for conventional aortography in most clinical settings [30-32]. 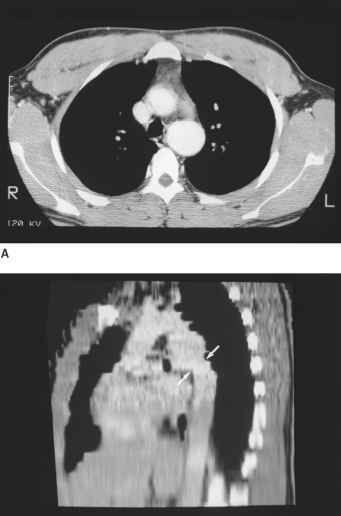 Despite the excellent published results of spiral CT for TAI, the technique has not gained universal acceptance even where available due to concerns of false negative examinations, particularly in cases where there is no mediastinal hematoma detected. However, it is almost certain that with the advent of multidetector-row technology, spiral CT will eventually supplant aortography to become the definitive tool for the evaluation of TAI. Aortography remains the gold standard in the evaluation of traumatic aortic injury. It is a safe and highly accurate examination with a negative predictive value for aortic injury approaching 100%. It has a particular advantage over spiral CT for evaluation of the ascending aorta, a region where the spiral CT detection of injury is limited due to motion and streak artifacts. Angiography is, however, an invasive and relatively costly examination that is not as rapidly available as spiral CT in most trauma centers and does not provide the global evaluation of the major organ systems affected in blunt trauma victims that spiral CT affords. Figure 11 Traumatic aortic transection. (A) Contrast-enhanced CT at the level of the aortic arch shows a periaortic (straight arrows) and posterior mediastinal hematoma. Note slight rightward displacement of the trachea and nasogastric tube. (B) Scan immediately below a shows an endoluminal flap (curved arrow) and pseudoaneurysm formation (p). 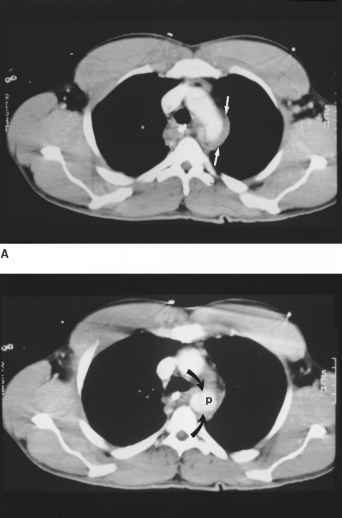 Figure 12 Traumatic aortic injury with pseudoaneurysm formation and pseudoco-arctation. (A) Contrast-enhanced CT in a patient with a history of a motor vehicle accident 3 years previously shows an aneurysmal proximal descending aorta. (B) Oblique sagittal reconstruction shows the aneurysm of the aortic isthmus with aortic narrowing distal to the aneurysm (arrows). Surgically confirmed aortic transsection with pseudoaneurysm formation. evaluation of the thoracic aorta and chest is often only part of a more extensive evaluation of the abdomen, pelvis, head, and spine. Since nearly one-third of patients with aortic injury have an abdominal visceral injury or pelvic fracture, most experts recommend performing an abdominal and pelvic CT as a direct extension of the thoracic examination . The spiral CT diagnosis of TAI includes both direct and indirect findings. 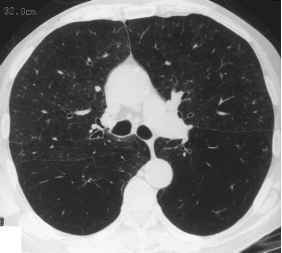 The detection of a periaortic hematoma, particularly around the aortic isthmus, is an indirect and nonspecific sign of aortic injury but at some centers will lead to an aortogram even in the presence of a normal aorta on CT (Fig. 11). An anterior or posterior mediastinal hematoma usually indicates an injury to the sternum or thoracic spine respectively. The absence of a periaortic hematoma or aortic abnormality on a good-quality spiral CT confidently excludes TAI. Hemopericardium or hemothorax are additional indirect signs of TAI but are most often due to other injuries. Direct findings of TAI include linear intraluminal filling defects that reflect either intimal or mural flaps from aortic laceration or transection, pseudoaneurysm formation, abrupt caliber change (pseudocoarctation) (Fig. 12), and active contrast extravasation. The distinction between minimal aortic injuries and nontraumatic aortic entities such as a ductus diverticulum, prominent origin of a bronchial artery, and atherosclerosis can be difficult and is often the source of false positive CT aortograms . The subtle aortic abnormality produced by a small intimal flap, mural hematoma, or small pseudoaneurysm may be seen on only two or three contiguous images. Aortography is recommended to delineate such subtle injuries and can usually distinguish between a normal variant or atherosclerotic plaque and a true aortic injury. However, in selected cases trans-esophageal or intravascular ultrasound may be necessary to better define the aortic abnormality.